One of my favorite counter service locations at Disney's Hollywood Studios is Starring Rolls. They offer great sandwiches and best of all, delicious cupcakes. 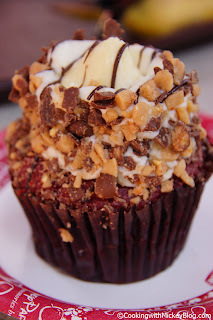 The Red Velvet Cupcake is a fan favorite! Place all dry ingredients in bowl. Blend eggs and oil and add to dry ingredients. Mix until smooth. Add buttermilk. Pour into lined muffin pan and bake at 350*F. for 30 min or until done. In a mixing bowl, add cream cheese, sugar, lemon juice, and vanilla extract. Add cornstarch, eggs, Cream together for 3 minutes. Fill in molds or rings and bake in a water bath for 45 minutes or until firm. Make cheesecake batter. After the cheesecake is baked and cooled add into mixing bowl and cream. Pipe on to red velvet cup cakes and roll in Heath bar crunch. I have got to go to Starring Rolls next trip. I cannot believe I have never been there! We love cupcakes!